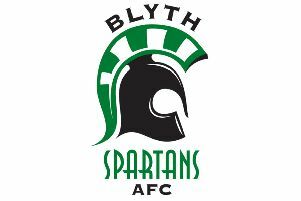 A dominant Blyth Spartans were left to rue a mistake at the back and a host of wasted chances - as they undeservedly went down 1-0 to Vanarama National League North leaders Salford City, in what was a fantastic advert for the division. Peter Jameson brought down Jack Renshaw in the box on 36 minutes, which allowed the striker to score the only goal of the game from the penalty spot. Spartans dominated the majority of the second half and came close to scoring on a number of occasions, but were unable to put the ball in the back of the net and claim a point that they more than deserved. Alun Armstrong’s side were also left cursing Liam Hogan’s defensive heroics - after the visiting captain was lucky to avoid being sent off just after the restart for a second yellow card. Going one better than in their Buildbase FA Trophy win over Stalybridge Celtic, Blyth made eight changes to the starting XI - as captain Robert Dale, Jarrett Rivers and Ryan Hutchinson saw a host of familiar faces return for the visit of the league leaders - including Daniel Maguire, who was making his first start since returning from injury. Salford had the better of the early going, with Michael Phenix twice getting the ball in a good position down the right in the first few minutes. However, he wasted both of his crosses in and was unable to find a teammate. Renshaw then burst through the Blyth back line with a sprint into the area moments later, but the less than ideal conditions thwarted the forward - as he lost his footing and slipped over before he could get a shot away. The home side were on the back-foot for the majority of the opening ten minutes, but it was Blyth that created the first real chance of the contest. Maguire got into the area and hit a left-footed shot towards the near post, but Maxime Crocombe dived well to his right to tip the ball around the post for a corner. Phenix was beaten to a header by Nathan Buddle at the near post three minutes later, but it fell straight into the path of Renshaw. The striker hit a forceful shot at goal, but Buddle stepped up again and blocked it behind. A mazy run from Hopson saw the former Whitby Town man create some space for himself at the edge of the area. His shot evaded the desperate diving body of Liam Hogan, but failed to test Crocombe in the visiting goal. Michael Liddle then dispossessed Phenix 30 yards from the Salford goal just after the 15-minute mark and drove at goal. The left-back looked to feed Maguire through a crowd of red bodies, but got too much on the pass and the chance was gone. Dale looked to get on the end of Maguire’s lay-off at the edge of City’s box with 18 minutes gone, but was hacked down by Carl Piergianni for a free kick. Hopson stepped up to try his luck, but drilled his shot straight into the City wall. Spartans and Salford were both playing their part in an enthralling match-up for the impressive 1040 in attendance at Croft Park, but the away side nearly took the lead in comical circumstances five minutes later. Ibou Touray swung a free kick in from the right, which looked to be a comfortable claim for Peter Jameson. A mix-up in communication saw Liddle head the ball dangerously close to the far post, but his blushes were spared when it passed the outside of the upright. The hosts continued to battle well with their full-time counterparts, but gave them a gift on 36 minutes that saw the table toppers take the lead - after a hopeful long ball bounced over the top of both Buddle and Renshaw, which saw Jameson rush out to try and claim it. The keeper was beaten to the ball by the Salford man, who was brought down in the box by Jameson - as referee Garreth Rhodes was left with no choice but to point towards the penalty spot. Renshaw then stepped up himself to calmly roll the ball into the bottom-right corner, with Jameson looking to go the other way. Spartans had done well up until that point, but refused to dwell on that disappointment when Dale crossed into Maguire on 44 minutes. Last season’s top scorer headed behind him with his back to goal, but it was a comfortable catch for Crocombe. With time running out in first half stoppage time, David Atkinson looked to channel his inner Ian Watson and hit a speculative shot from distance. However, it went well wide as the whistle blew for the break. The start of the second half started in frantic circumstances and the Croft Park crowd were baying for blood within the first 60 seconds - after the already cautioned Hogan dragged Maguire to the ground. Rhodes had a second word with Hogan after his earlier booking, but refrained from showing the Salford captain a red card. Hopson drilled the resulting free kick towards Reid at the back post. The lofty midfielder had two bites at the cherry trying to put the ball in the back of the net, but Salford eventually cleared their lines. City appeared to be losing control when Piergianni went in hard on on Reid three minutes later. Rhodes again had a word, but no card was produced for the defender. Hopson’s free kick from Piergianni’s foul found Reid again at the opposite post, but his header was straight at Crocombe. With the hour mark approaching, Maguire turned and shot from 22 yards. The striker fizzed the ball across the face of goal, but it went just wide with the keeper scrambling across to try and get to it. Spartans pushed forward more and more against a side that seemed happy to sit on their 1-0 lead, which lead to Hopson playing the ball into the feet of Maguire left of goal. ‘Nipa’ could only shoot over from a tight angle, with Hogan providing just enough of a distraction. Maguire was looking for his third chance in four minutes, when Liddle fired an inviting ball into the box. Unfortunately for him, Salford skipper Hogan was there to thwart him again - as his header took the ball away from the striker’s foot. Blyth had dominated the second half, but nearly got caught out again by their own undoing with 20 minutes remaining. Jameson let a cross from the right somehow slip through his fingers and across the face of goal. Luckily, another mistake from the goalkeeper didn’t result in a second Salford goal - as he had Atkinson to thank for clearing the ball off the line at the far post, before Renshaw could run in and capitalise. Blyth huffed and puffed as the game entered the final ten minutes, but were desperately unlucky not to finally restore parity. Hopson’s 81st minute free kick produced a goalmouth scramble, which eventually saw the ball drop perfectly for Rivers. Firing low through a crowd of bodies, the winger was just about wheeling away in celebration when Salford substitute Jake Beesley hacked the ball away on the line and preserve his side’s clean sheet. City broke two minutes later and looked to have grabbed an undeserved second goal, when Beesley’s cross was met at the back post by Joshua Askew. The ball appeared to be trickling into the goal, but Jameson threw his foot at it to boot it away to safety. The hosts continued to pile forward looking for an equaliser, but Crocombe got down well to stop Hopson’s low drive with five minutes left. In the last minute, Dale’s shot was blocked and Reid was brought down in the box in between Crocombe and Hogan. The majority of Croft Park shouted for what looked a stonewall penalty - along with the home dugout - but Rhodes ruled out any chance of a late spot-kick for the hosts. Dale had another pop at goal in the first of five added minutes at the end of the 90, but a superb diving header from Hogan stopped his rocket from bursting the back of the net - as Spartans ran out of time in their attempts to force a draw, which was the least their performance deserved.